Thermal Imaging – Prevent breakdowns and accidents by identifying faults before they become a problem. When an electrical fault occurs, the circuits on your premises may become abnormally hot in certain areas. It’s difficult to spot these problems early, as they don’t typically display any visual symptoms. However, left unchecked, the excess heat can lead to power outages, or even explosions, sometimes with expensive results. Thermo imaging can help identify faults in your electrical system. 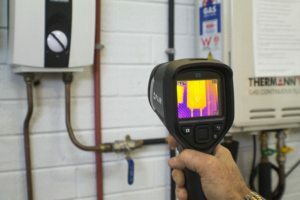 Using infrared sensors, a thermography scan will reveal the full spectrum of heat signatures present in the circuits and various pieces of equipment on your premises. Cost savings are made if the procedure is used as part of a regular preventative maintenance program. Unexpected breakdowns in all types of plant can be prevented well in advance of their becoming apparent. Repairs and/or maintenance can then be scheduled as required. Contact ACE+ today on (08) 9272 1488 to book a thermal imaging scan. We offer appointments on an as-needed basis, or can help you plan a regular inspection schedule to proactively monitor your facilities.